What Is A Sirtfood Diet? Plus, 10 Sirtfoods to Turbo-Charge Weight Loss. We’ve all heard the term superfood, but have you heard about sirtfoods? They’re of the same family, essentially. Perhaps, sirtfoods could even be considered superfoods in their own right. They do indeed serve similar underlying purposes in the body, and they offer up more benefits than the average food when it comes to the body’s inner workings. The sirtfoods are good for keeping inflammation low, supporting the metabolism, weight loss, immunity and healthy aging. This is due to sirtuins, a type of proteins in the body, which act as protectors for our cells. Sirtfoods are simply foods that activate these sirtuins. The miracle claim is that you’ll lose 7 pounds in 7 days if you follow the sirtfood diet closely. Don’t worry, though – we’re not big fans of fad diets with drastic promises. The foundation is interesting, and the underlying nutritional mission is something we personally think is rather sustainable, so hear us out! If we don’t have your attention yet, there will be chocolate and there will be wine. Sounds too good to be true – right? The first week has a pretty specific eating plan you need to stick to. Remember that promise? Well, it comes with a little effort on your part. Initially, it sounds a bit restrictive and ‘cleanse-like,’ but it gets better. 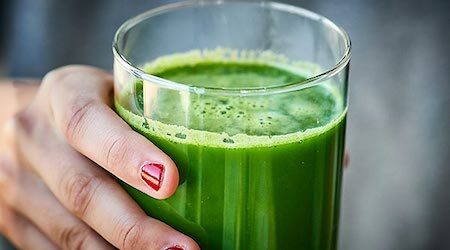 You’ll want to aim for around 1,000 calories everyday including three glasses of green juice and one meal abundant in sirtfoods each day. The second week, you’ll up your calorie intake to 1,500 calories per day which includes two green juices and two meals rich with sirtfoods. After that, there’s no real rhyme or reason to your sirtfood diet which is why we like it so much! The idea is simply to include as many sirtfoods in your diet as possible to activate the sirtuins, which will keep our cells vibrant and healthy, warding off inflammation, illness and unwanted weight. Overall, we believe it’s a great approach to including more vitamin and mineral-rich whole foods in the diet with an emphasis on greens. The long-term agenda generally includes three sirtfood-rich meals per day along with one green juice. Over the course of the following weeks post-introduction, you should expect to see steady weight loss at a healthy rate. Considering the calorie restrictions, you might be wondering why we’re placing our stock in the Sirtfood Diet. We believe it steps outside of the fad diet mentality despite the ‘rapid weight loss’ and loose rules, though. For one, the introduction comes in stages, so the 1,000 calorie days don’t last very long. If you’ve ever tried that diet out, you probably know that it only leads to hunger… and hanger! The Sirtfood Diet includes many of the same foods we use in our 9-week Happy Body Formula menu. While we do eliminate wine and chocolate during our Reset phase, we do reintroduce them, as we believe these foods have antioxidant properties and the ability to restore balance in the diet. Who doesn’t enjoy the finer things in life? We love that the sirtfood diet allows for indulgence with some nice health benefits to boot. Sirtfoods serve a greater purpose in the body, and beyond weight loss, this ‘diet’ is truly used to keep the immune system strong and healthy in the long run. With that said, it offers up quite a sustainable platform for lifelong health. The immune system is closely tied to our overall wellbeing, so providing the body with the tools our cells need to stay strong and reduce inflammation caused by illness is important. All in all, the Sirtfood Diet focuses on putting the foods most abundant with vitamins and minerals into your daily diet multiple times per day, maximizing nutrition at every meal. It’s a simple concept with an easy-to-use formula and clear benefits. Interested in incorporating more sirtfoods in your diet? Try the 9-week Happy Body Formula which includes sirtdiet-friendly recipes for weight loss, immunity and overall health.